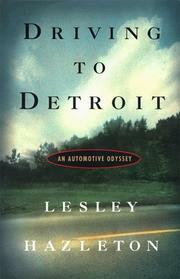 Hazleton (automotive columnist for the Detroit Free Press and author of, among other works, Confessions of a Fast Woman, 1992) takes us on a journey into “the heart, soul, and wallet of the enduring American obsession with the car.” The author is an unorthodox guide. Born British, a former psychologist, former political correspondent, an environmentalist, she is not the type of person one would expect to be bonkers about cars. She hits the road—a six-month journey from Seattle to the Detroit Auto Show, with countless detours along the way. She goes in search of the culture of cars; she finds it, for instance, at Bonneville Salt Flats of Utah, where Craig Breedlove, at age 59, attempts (unsuccessfully) to break the sound barrier in a car. She finds it at Concours d’ElÇgance at Pebble Beach, Calif., where the super-rich display their multimillion-dollar autos. She finds it at Frog Todd’s ABC Junkyard of Houston, Tex. What is it about cars? There is sexuality. (In a line that could be straight out of Raymond Chandler, she writes of one classic car: “It had a sensuously chiseled sleekness, like the high cheekbones of a supermodel.”) At high speeds, there is the sense of transgression, and always there is the illusion of power, of being in control of tons of metal, when we control little in our lives. There is the romance of death: It is cool to die in a crash, but only if you are young and in a hot car (her father’s death, of natural causes, in England in the middle of her journey heightens her awareness of this foolish illusion). Would James Dean’s legend continue if he had died in a Hyundai, she wonders. Hazleton arrives at no grand conclusions here but in finely etched vignettes reveals why we so dearly love our automobiles. An exceptional writer at the top of her game. A car book that is about a lot more than cars.